A large area with flat ground and lots bush make a great safari. This is a good area to park the truck and stalk through the bush for game. 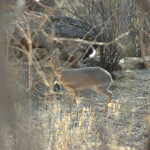 Game is plentiful in the thick bush. Most of the land is flat and easy to walk. One large hill provides a view of the surrounding area for spotting. 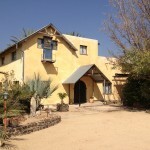 Accommodations are a fine traditional farm house with private guest rooms. 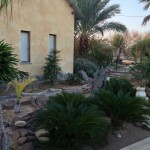 The farm house yard is a comfortable retreat. 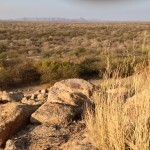 This safari area is Farm Ruppell in Central Namibia. 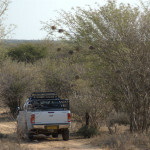 It is an excellent place to start your safari, and is 1 hour drive away from the airport in Windhoek. The best game here is black wildebeest, blue wildebeest, hartebeest, impala, warthog and blesbok. We hunt mostly the wildebeest and blesbuck because there are more of them. You have a better chance of getting a really good trophy. This is open, flat country with bush land and easy to walk. In the mountains on the west end of this area, there is a good chance to hunt mountain zebra. Most of the area does have a game fence, but it is such a large place that it is definitely a fair chase for the animals.